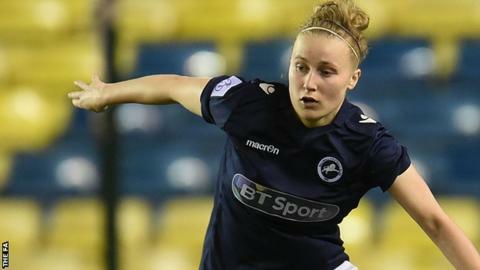 Defender Naomi Cole kept a clean sheet as stand-in goalkeeper and helped set up the equaliser in Millwall's 2-2 Women's Super League Two draw against Oxford United. Cole took over from the injured Sarah Quantrill after the break as the Lionesses fought back from 2-0 down. A long clearance from Cole late on went all the way through to Rinsola Babajide, who netted the leveller. "She came out, she swept and she did really well," said manager Dan Mlinar. "It just shows how dominant we were in the second half. "It wasn't from last-ditch defending or from good defensive play that we were able to protect her, it was because we were on the front foot. "We had possession of the ball, we were pushing them back and pressing them high so we kept them as far away from our goal as possible and it worked a treat. "We were disappointed being 2-0 down having, we felt, played all right but we just knew we had to keep going and once we got the first goal we felt we could get something and we did." Helen King had opened the scoring on four minutes for Oxford, with Ella Franklin-Fraiture lofting the ball over Quantrill to double their lead. However, Grace Fisk headed in from a free-kick by Ashlee Hincks to spark the Lionesses fightback. Elsewhere, Corinne Yorston scored twice to help Yeovil Town thrash WSL 2 bottom side Watford 7-1. Yorston opened the scoring from the penalty spot on seven minutes after Sarah Wiltshire was fouled in the area by Nicola Pepper, with further goals coming from Annie Heatherson, Ellie Curson, Wiltshire, Helen Bleazard and Emily Donovan. Yeovil move to within four points of Reading in second spot, after the Royals were held 1-1 by Aston Villa. Durham ended a five-game losing run to beat London Bees 4-1.